If you’ve ever wanted to own a truck that can guide you safely through tornadoes, earthquakes and just about every other doomsday scenario, Chevy has a concept for you. The automaker just revealed its new Silverado Black Ops concept truck — a concept Chevy has likened to a mobile survival kit. 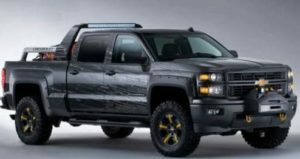 That’s thanks in part to the vast array of survival-themed features Chevy has built into the concept, which is based on the 2014 Silverado Crew Cab 4×4. The Silverado Black Ops features protective body armor and a bed-mounted vault that can be locked to provide security for a slew of survival items. Items in the concept include gas masks, rope, a shovel, a power pack that uses solar energy and a military-grade first aid kit. If that’s not enough to see you through the apocalypse, the Black Ops concept allows space for a generator, extra fuel supplies and a stockpile of food. Though the Black Ops has plenty of features that could prove invaluable in a disaster scenario, it also looks the part. The Black Ops has custom bed rails and a light bridge with light bars facing in multiple directions. Fender flares, tubular assist steps and off-road tires mounted on custom 18-inch wheels are also included. While this rough, ready and heavy-duty truck might look the part, it also has plenty of features that could prove invaluable in a real disaster zone. A front winch and raised suspension give the Black Ops superior ground clearance and strong 12,000 pound towing capacity. The winch has a custom cover with a bright LED spotlight and tow hooks. A corner step bumper allows for quick gear retrieval. Standard Silverado features such as a 255 horsepower V-8 engine, navigation system, six speed automatic transmission and StabiliTrak control system are included in the concept. The interior has eye-catching black seats with custom trim and yellow piping. Yellow trim can be seen throughout the cabin, adding to the overall aesthetic effect. The Silverado Black Ops concept was unveiled just in time for an appearance at the upcoming Specialty Equipment Marketing Association show in Las Vegas, Nevada.